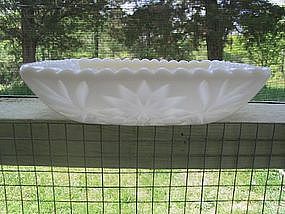 Vintage unknown manufacturer milk glass dish/bowl. I've always thought it looked like the fossils that you find in rocks. It is approximately 6 3/4" in width and 1 1/2" in height. No damage. Additional photos by email. I need your zip code to calculate the postage.